Warren Gatland revealed himself and his Wales squad as sensitive souls after the emphatic 67-14 win over Italy in Cardiff. The record-breaking result saw Wales claim second place in the 2016 Six Nations Championship behind England - the first time they have taken the runners-up spot since 1980. But it's a tournament when the Welsh have come in for criticism at home for the style of their play. Even a fourth consecutive win over France could not stop the media sniping. Gatland was out of the blocks like a rush defence when asked if the development would continue on the summer tour of his homeland. "It depends on how much you criticise us," the New Zealander replied. "It kind of has an impact on us in spite of what you might think. "We've been criticised for playing same way rugby, playing the touch lines. I think if you are observant, we haven't been playing that way as much. "We've played other players in wider channels and some different patterns and yet we still get criticised as same old same old." Gatland's response was perhaps understandable at the end of a week when he had to apologise for describing Joe Marler's "Gypsy boy" comment to Samson Lee as banter and found himself involved in a controversy over promotion and relegation from the Six Nations. It's also a reasonable response given the level of success Wales have enjoyed under his guidance since 2008. His team has walked the walk the Kiwi has talked. They have three Six Nations titles and a World Cup semi-final to show for it. 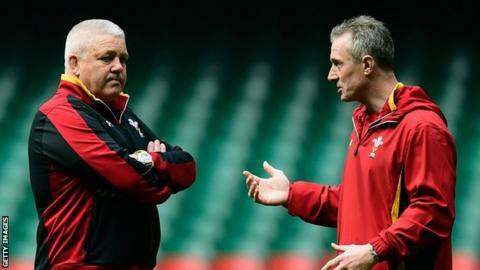 Gatland says Wales are changing their game, but asked for patience. "We've mixed it up with forwards in some of the wider channels and it hasn't always quite clicked," he said. "But there are times when it has like the last part of that second half against England and today and parts of other games. It looks like a game we can develop." Wales' tournament swung on a point dropped in Ireland and a defeat by England, which had a profound impact. Ireland deserved credit for their performance in the 16-16 draw in Dublin, but the poor first-half display against England which saw Wales trailing 16-0 before hitting back late to lose 25-21 was the real cause of Welsh disappointment. The silver lining in that very black Twickenham cloud was the nine-try rout of Italy, said Gatland. "That was not good enough. But the players responded after half-time last week and they certainly responded today," he said. Looking ahead, Wales face England next at Twickenham on 29 May, before three Test matches against a New Zealand rebuilding after losing key players following their World Cup win. Wales have not beaten New Zealand since 1953, and face a daunting challenge in June. Even in the absence of Carter, McCaw, Nonu and Smith, the All Blacks will be formidable opposition. "With any team you have to believe in your own ability and we're wasting our time getting on the plane if we don't think we can go there and push New Zealand hard," said Gatland. "We've got to believe in ourselves and this group of players and the squad. "We have to go down there and believe that if we're on our game and things go our way we're good enough to win. "There's a lot of pressure on those new players coming in to the [New Zealand] squad and for both sets of teams there's 12 months later and a Lions tour to look forward to as well." New Zealand rugby is not big on sentiment or sensitivity. And Gatland is a product of the tough Waikato school of the game - a hard-headed coach whose teams play hard rugby with considerable success. He wants the Welsh public to get behind him and his team. "You have no idea what it means to these players when people believe in them and get behind them - it has a massive influence," said Gatland. There'll be no argument with that on the streets of Cardiff. But the fans like some sauce to go with their beef. Substance first, but style to go with it - the way Wales played in the final 10 minutes at Twickenham and in the second half against Italy.